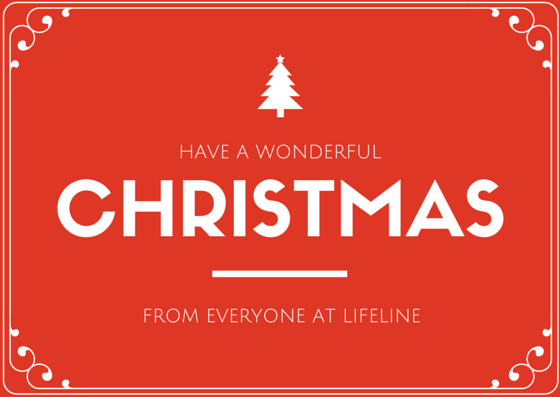 Everyone at Lifeline would like to wish our colleagues and our amazing supporters a wonderful Christmas and a very Happy New Year. 2014 was challenging year for Lifeline but we got through it with your help and we’ve succeeded in assisting over 300 women by providing free emotional and practical support. We wouldn’t have been able to do any of this without all of you helping out, whether that has been fundraising, attending our events or even just helping spread the word about our services. All of us at the office, staff and volunteers, are looking forward to a small break over Christmas and followed by a bigger, brighter and busier 2014! In particular we would like to thank all the volunteers at our 2 shops and their amazing managers, Gina Riva, Marianne and her Facebook group of donators, Emelye who did a massive sponsored walk on our behalf and all the knitting groups and church groups who make, donate and fundraise for us. We appreciate all of you so much. Merry Christmas and have a happy holiday everyone!